Eggless Cake In Cooker is an example of a perfect Jugaad that we as Indians can be proud of . 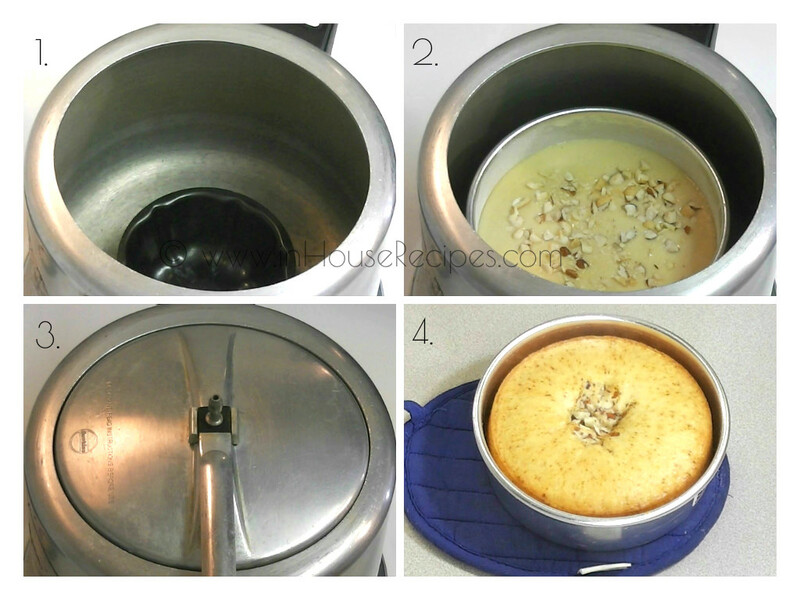 Yes, we can bake the perfect cake in pressure cooker that is the heart and soul of any Indian Kitchen. 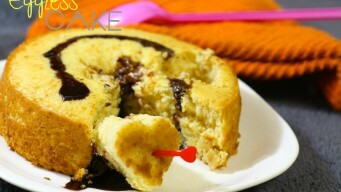 We have recently published the recipe of Eggless Cake In Oven and today we are sharing the same with pressure Cooker. 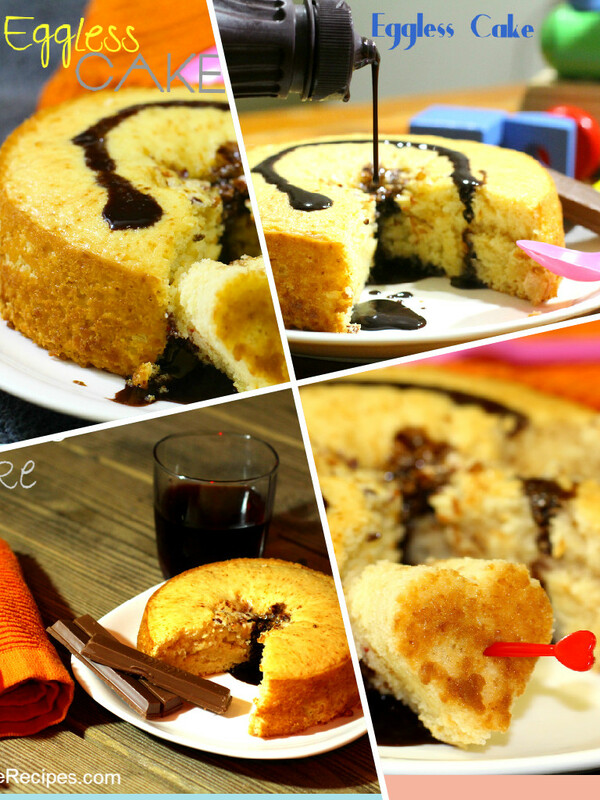 This recipe takes you through the journey of making Eggless cake and establishes the fact that you can bake the same aromatic, soft and spongy cake with your favorite cooker as in any oven. This stands true for baking the cake with-out an egg as well. This is incidentally the most requested recipe by our viewers. There are other variations of cake that we have tried and tested using the cooker. 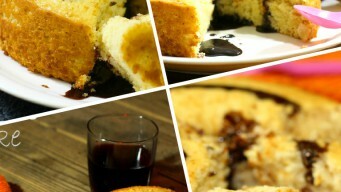 You may like to try Orange cake (with Egg) or a bit of healthier one like Eggless Atta Cake. We are using the pressure cooker here. But, keep in mind that cooker's pressure in not used in real sense due to the removal of its Whistle or weight. Hence, this does not really blast as there is no pressure build up inside the cooker. 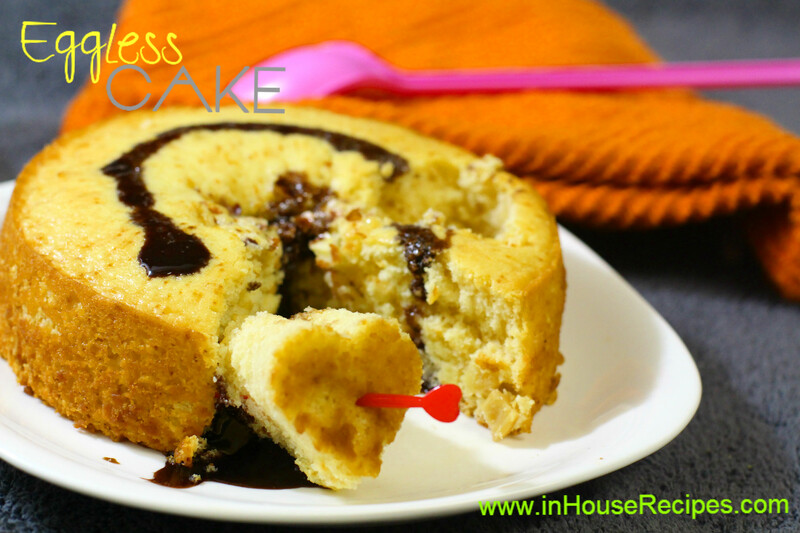 We also have the Eggless cake recipes made with Oven Or Microwave Convection Oven here. A brief clarification about baking in Microwave. You can't really bake a cake in Microwave unless it has convection mode to give it addition powers. You can read more about it here. 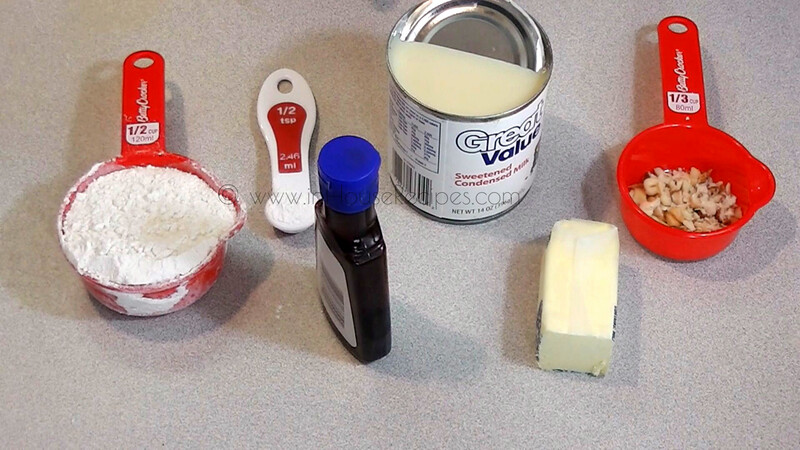 Ingredients for Eggless cake in cooker should be ready with you. Take a bowl, Add butter and melt it using a microwave. It would take 30 seconds. You can also use your stove to melt the butter. Just make sure that you remove it from stove top as soon as the butter melts. 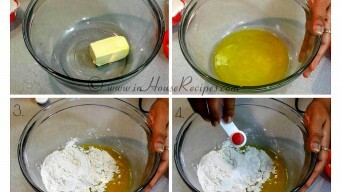 Now, we will add all ingredients and mix them together with Butter. 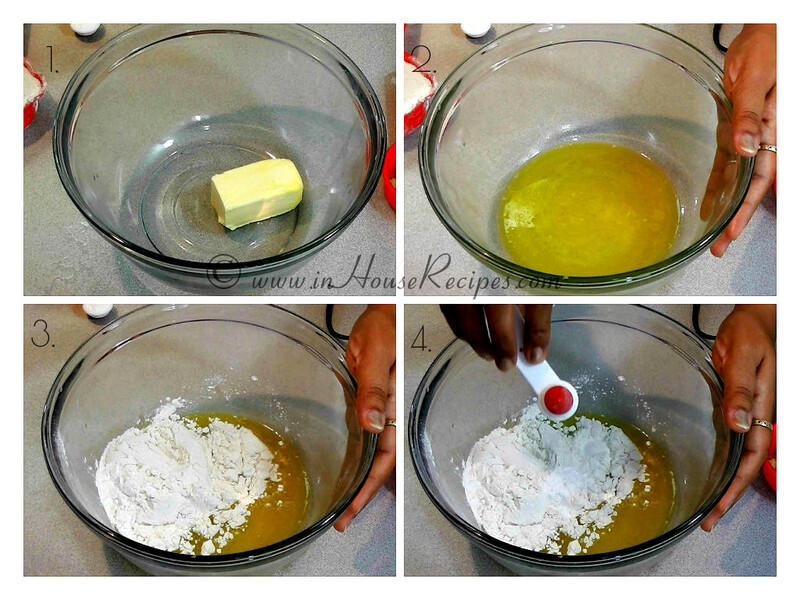 Add All-purpose-flour, Baking powder, Vanilla Essence and Condensed Milk in the melted butter. 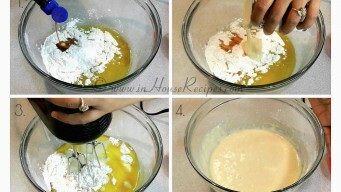 Beat/Mix/Whisk the mixture well using a hand blender to make a smooth paste. We have taken a round shaped Aluminium tray. You can take any other shape or a microwave safe tray. Grease it with 1 tsp of Oil. All its internal walls and base should be greased. Sprinkle 1 tsp of All-Purpose-Flour on all its internal walls and base evenly.Hold and rotate baking tin in a way that all the flour should make a thin layer over the greased Oil. Flour layer will help us identify if there is any space where is left un-greased with Oil. 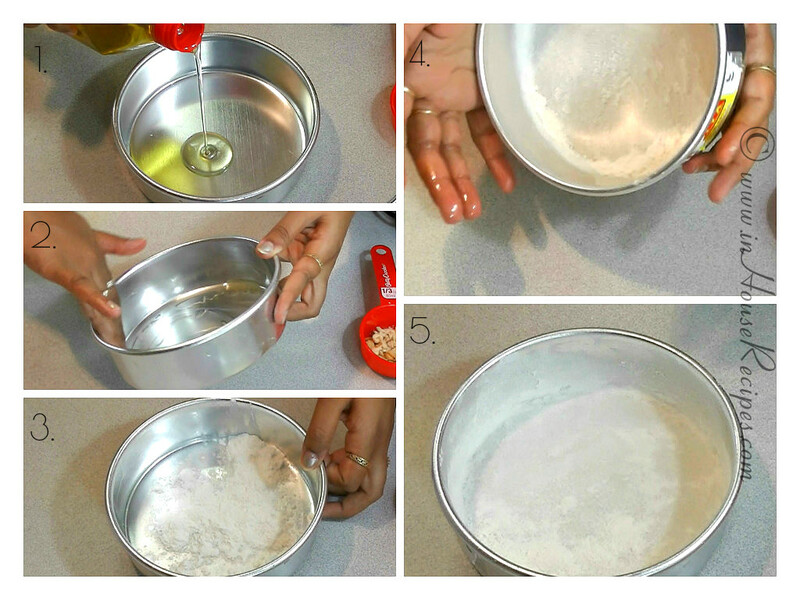 Oil greasing helps in creating a non-sticky layer between cake and baking tin. 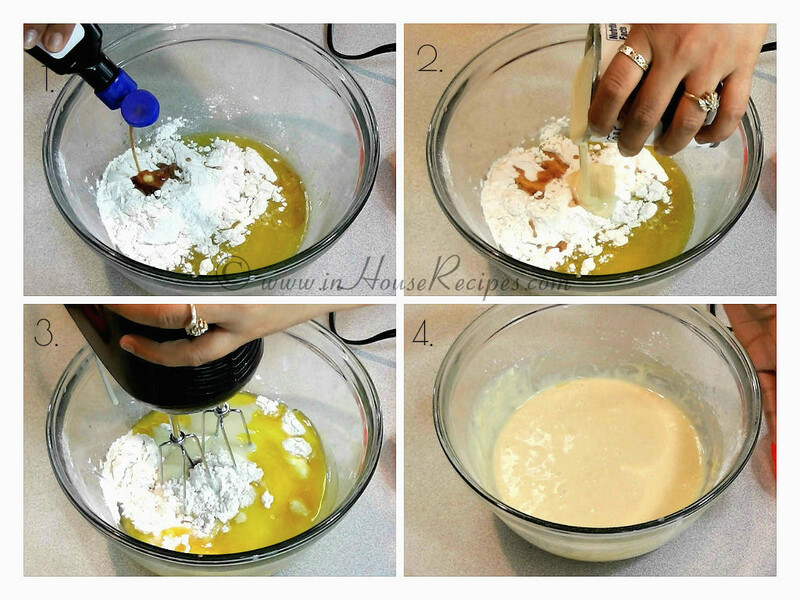 Throw out the extra left-over flour from the tin and then add the cake paste. We are using a 5 liter pressure cooker. You should use a cooker big enough to hold your baking dish/tray. Note We are not going to use any water in cooker. There is a big concern with people sometimes that cooker might burst if you do not add any water. Do not worry, cooker will not burst simply because we are NOT using the cooker Whistle or Cooker Weight to make this cake. Since, we are not using the whistle/weight, there is no chance of cooker building steam pressure inside it. It is a tried and tested recipe and nothing happens to the cooker. It is safe. If you are still not sure, you can watch our video on how we are doing it. 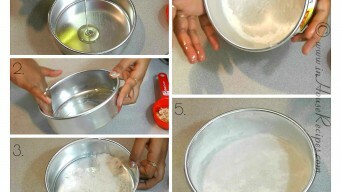 First of all, keep the divider bowl/plate in cooker and then place the baking tin carefully on top of it. Switch ON the stove on high flame. Close the cooker lid. Do NOT use the cooker whistle/Weight. Let it cook on high flame for 2 minutes now. After 2 minutes, turn the stove on medium flame and let it cook for another 30 minutes. 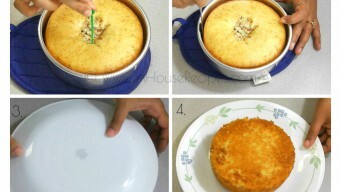 After 30 minutes of baking, open the cooker lid and take out the cake. We need to use toothpick to test the cake’s readiness. Poke toothpick at the center of cake. If the toothpick comes out clean, cake is ready. Else, you need to bake it for another 2-5 minute. Normally, the baking time difference is due to the heating capacity of the Stove. You know your stove’s power and heating more than anyone else. Hence, you may experience a 2-5 minutes difference in baking time. 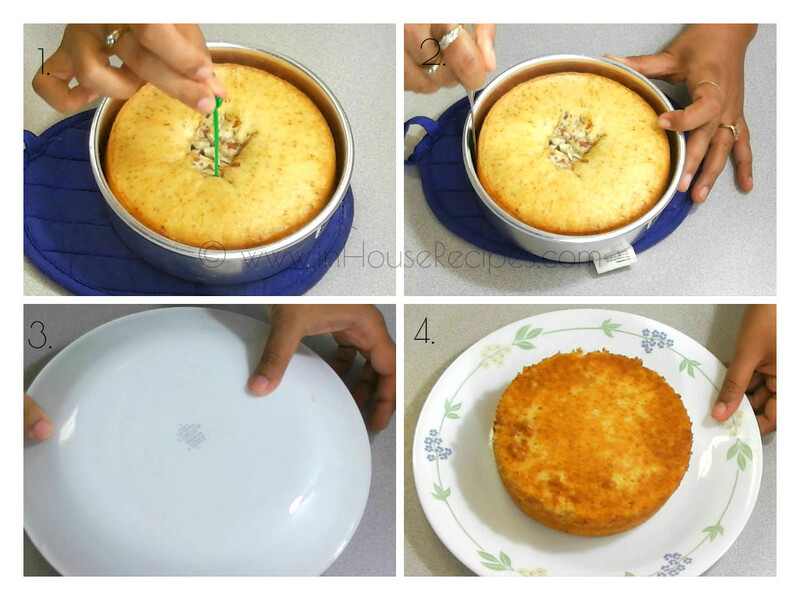 Use a knife to separate the cake from the baking tin. It should get separated easily with no damages to the cake’s skin as we greased the tin with Oil. Now, take a plate. Keep it on top the baking tin and invert to bring out the cake. Turn it upside down again. The soft and spongy Eggless cake is ready. So, we just made the Eggless Cake In Cooker and if you believe me, it takes less time than the one baked in Oven! 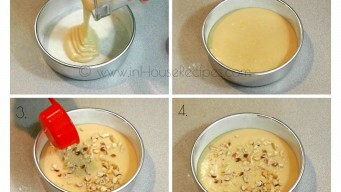 The only thing is that you have to follow the steps as mentioned above and you can bake the cake easily in cooker. 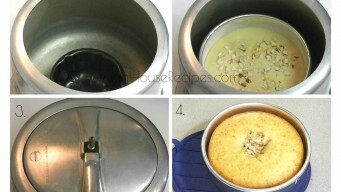 The cake can be refrigerated and stored for about 4-5 days. But, keep in mind that the cake would start losing its softness as soon as you refrigerate it. So, it is best to eat the cake fresh. 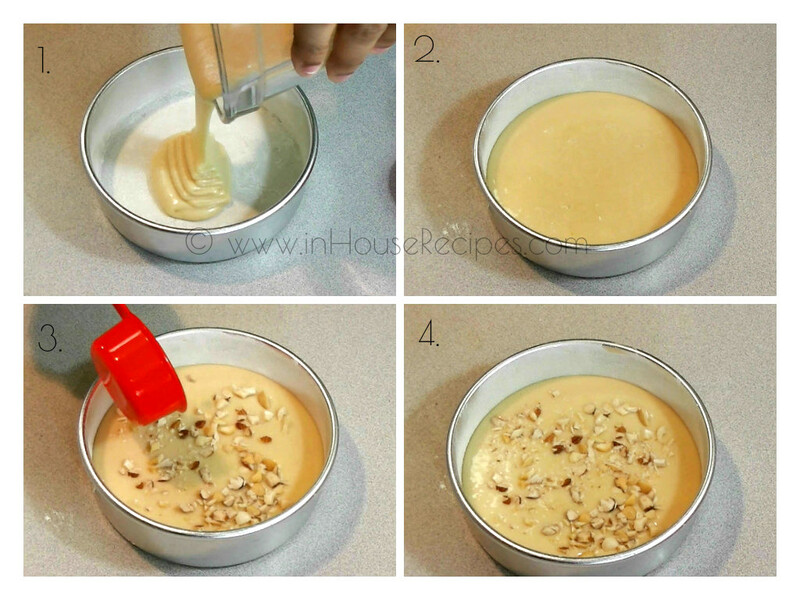 There are multiple ways of decorating the cake with whipped cream or with chocolate sauce or any other stuff that you may want to eat it with. We ate it with the Chocolate sauce as you can see in the images. You can also slice it into small marble shaped pieces and serve with evening snacks when you are having fun while sipping Chai Tea.